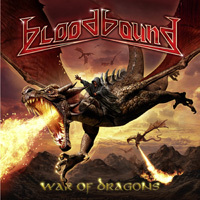 Coming off the success of a very powerful CD/DVD live performance, One Night Of Blood, Swedish power metal heroes Bloodbound return with their seventh studio album, War Of Dragons. If you think their might be a lyrical theme there, you'd be right. The album is about flying monkeys. Just kidding. Dragons, and lots of them. After that, musically, Bloodbound is up to their old tricks, or trademark sound, which is pure bombastic melodic power metal. And power is an understatement as this album is a rush of bullet train pacing from start to finish. You might find some slight moderation within Silver Wings or Fallen Heroes, maybe the title cut too, but, otherwise, things roar along throughout. After this, add the typical Bloodbound elements to complete the soundscape: bombastic twin guitar riffage, equally large and embellishing orchestral synths, immense, often choral-like, vocal arrangements and, of course, massive soaring guitar solos. It's all good, if not simply more of the same. And that's not a bad thing. Basically, War Of Dragons is everything you like about and want from Bloodbound. There's really not much more to be said, except to say there's much to be said for constancy and consistency. 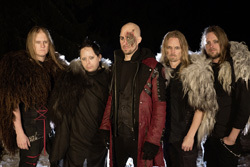 Once more Bloodbound delivers the Bloodbound power metal goods. Favorite cuts: Silver Wings, Dragons Are Forever, War Of Dragons, Battle In The Sky. Easily recommended. Basically, War Of Dragons is everything you like about and want from Bloodbound. If like anything they've done recently, you will dig this album. Recommended.